Steven Universe is one of three Cartoon Network shows I remember seeing commercials for (the others being Clarence and Uncle Grandpa) but never got around to watching. 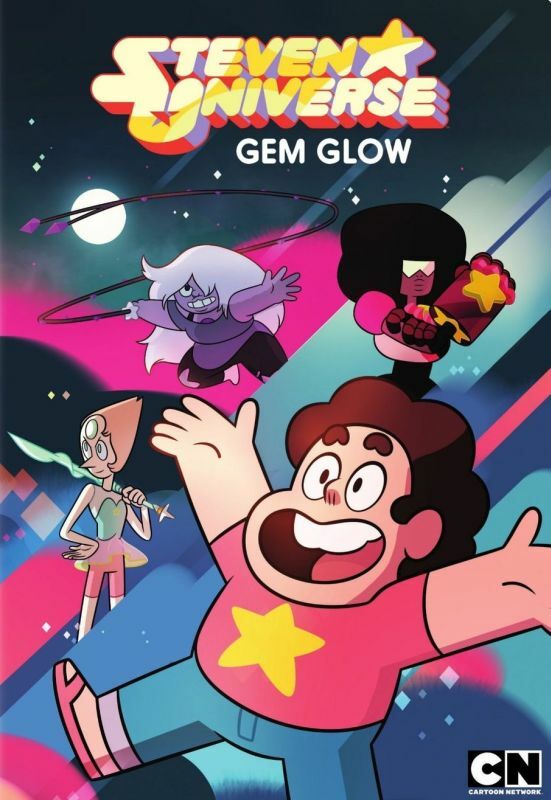 I just watched the Steven Universe: Gem Glow DVD which contains 13 episodes from the 52 episode first season. All of the episodes are within the first 22 of the season so it makes me wonder why they didn't just use all of the first 13 episodes then call it Steven Universe Season 1, Volume 1 . Steven Universe is about a boy named Steven Universe who lives with the Crystal Gems, a group of ladies who each have a magic gem stone inside their body. Garnet is tall, mysterious, and the leader of the group, Amethyst is short, crude, and impulsive, and Pearl is thin, intellectual, and elegant. Steven is a Crystal Gem as well, apparently inheriting his gem from his mother, but he has yet to learn how to activate or use his gem powers. Steven lives with the other Crystal Gems in Beach City, and they act like mentors and older siblings. Steven's Dad, Greg Universe, lives in his van and runs a car wash. He absolutely loves Steven and misses his wife, Rose Quartz, dearly. I love his character and his interaction with Steven. Steven is a lighthearted kid that is both trying to have fun and also trying to learn how to use his powers so he can help the other Crystal Gems. The episode titled "Cat Fingers" finds Steven learning to use his transformation power. The closest he can get at first is transforming one finger into a cat, but things quickly escalate while the Crystal Gems are away. We anticipate the arrival of the Gems to fix Steven's problem but instead Steven figures out a solution himself and has his dad help him carry it out. I thought that was really just a great moment with Steven coming to his dad in a moment of need, then figuring out how to solve his problem and getting his dad to help. The episode "Rose's Room" is a bit creepy and felt like some kind of Twilight Zone episode. I don't want to say too much about it but that was a good episode. I also really liked "Laser Light Cannon" which is another one where Steven and his dad work together, this time to help the Crystal Gems defeat a giant eye that appeared in the sky and is gradually moving closer and closer. This is a fun light-hearted, humorous show and I look forward to seeing more. I'm not sure why they put the episodes out of order on this DVD as I think they would have worked better in order, but it was enjoyable regardless. There are no special features to speak of, except that they call the pilot episode a special feature.